Podcasts are my #1 my audio choice. When I run or walk, I make sure I have at least one podcast episode downloaded to my iPod before I head out the door. They’re a handy–and free–way to gain insight from the experiences of others as I go about my daily routine. I feel that I have grown not only as a business owner as a result of these (since many of them are entrepreneurial in nature), but in other ways as well. With a few of my podcast subscriptions, I never miss an episode. With others, I pick and choose what is most relevant or interesting to me. The beauty is that I can mix it up, pause and come back, listen later, or go back and listen again if I want to take some notes. Do you have some favorite podcasts I’ve missed? Please share with me and other readers in the comments! Loved listening to you on the Brilliant Business Moms podcast this week! Your story is so interesting and inspiring, I appreciate you sharing it! 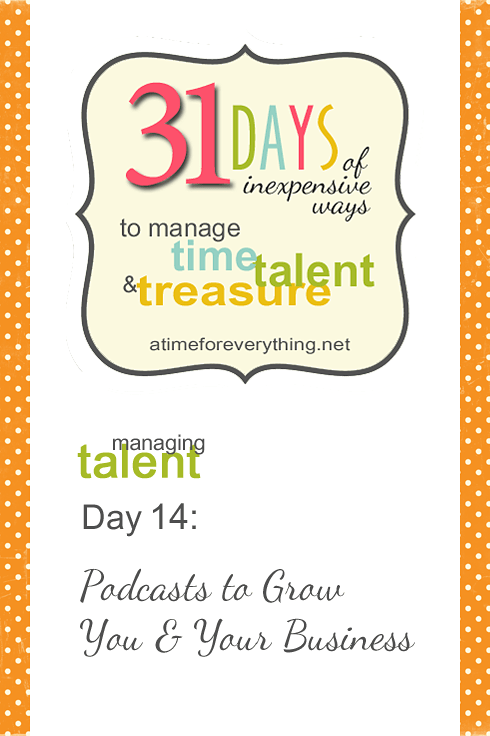 Just finished listening to your podcast–fabulous job! I loved hearing the story from start to finish and all your great tips for business. I’m not a business owner but it gave me an appreciation for those online sites that I purchase from and all the work that goes into making it easy for me to shop! Also enjoyed seeing your fav podcast lists. I was actually hunting around your site the other day looking for a old post that I thought you mentioned podcasts. Great timing! Thank you again, Beth Anne (and Sarah). It was really fun, largely because you ladies are so warm and sincere and good at asking questions. I’m so glad you started this podcast! Thank you for stopping by, Olivia! Check out The Lively Show….Jess Lively has the best guests, and you would be a great addition one week!! That’s a new-to-me podcast, Joan! Thank you for sharing!